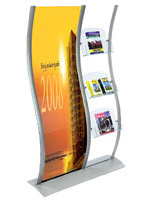 Our literature displays are great for featuring large quantities of printed materials. 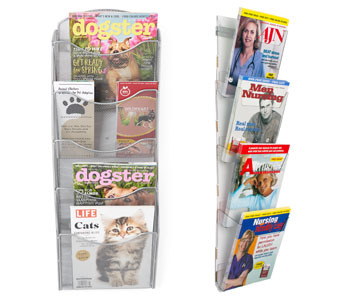 These periodical racks are made for a range of uses, from retail stores selling magazines to trade show exhibitors promoting their company with brochures. 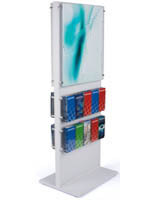 Literature displays are offered as floor standing, counter sitting, and even wall mounted units to fit in any open space in the establishment. 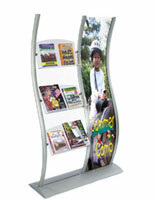 In addition, they're offered in any size, from single pocket holders to massive tiered showcases for featuring as much printed media as possible. 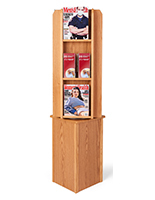 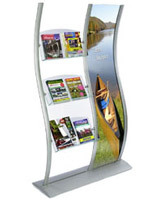 Browse our large catalog of literature displays for the right model for your business. 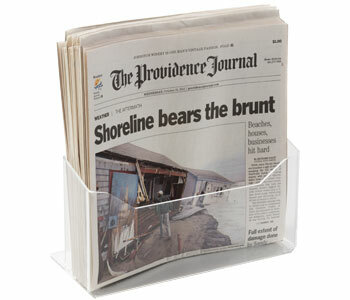 Where are these periodical showcases used? 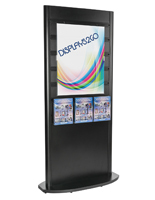 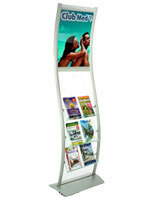 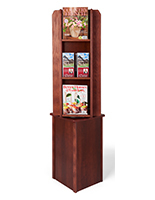 Literature displays for magazines and catalogs are utilized by both in merchandising and self promotion. 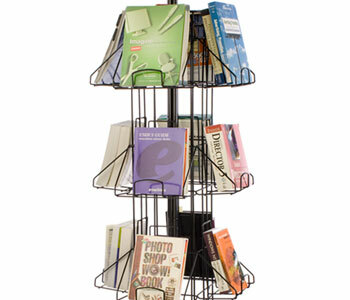 The racks for 8.5" x 11" media come in a number of shapes and sizes to accommodate these different uses. 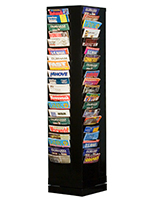 In retail stores, large periodical fixtures can hold lots of magazines for sale, with deep pockets for holding enough stock. 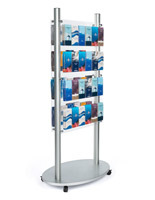 Tiered shelving units are ideal for showing the title and front cover, allowing customers to see what they want to purchase. 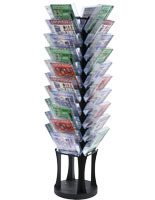 Spinners also feature large quantities of catalogs in one place with a small footprint. 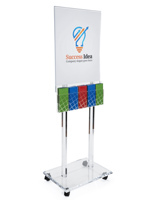 Portable literature displays are ideal for traveling businesses, especially ones that go to trade shows. 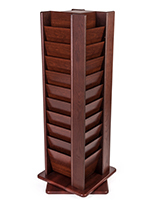 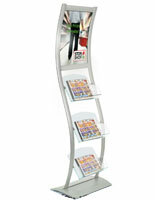 These folding brochure and catalog racks are made to have a lightweight design and fit to a compact shape. 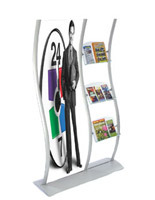 This is great for promoting your products and services with printed media. 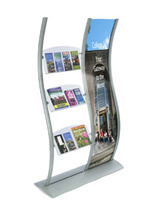 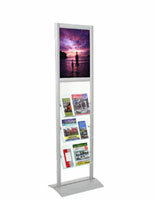 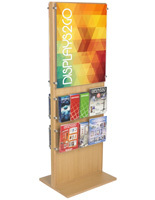 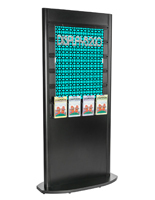 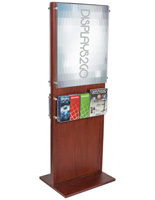 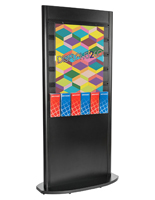 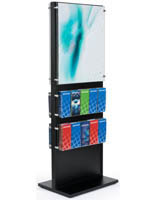 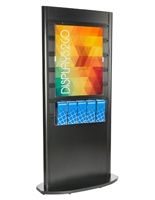 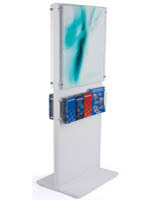 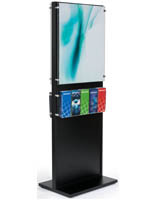 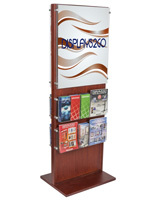 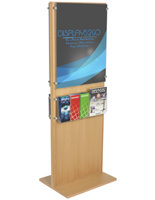 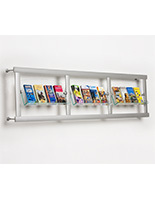 Wall mounted brochure racks are a great choice for promoting specific services. 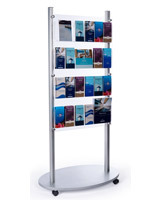 Businesses like banks, travel agencies, and real estate offices often use these leaflet fixtures to give customers more information about their opportunities. 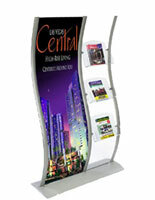 Floor standing and countertop models are also great ways to raise awareness of your printed materials. 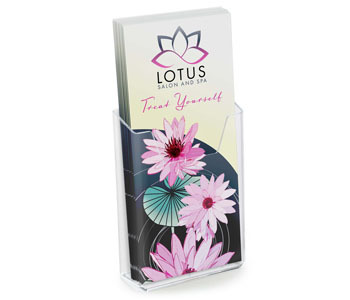 Our business card displays are perfect for office environments, whether they have one slot or forty eight. 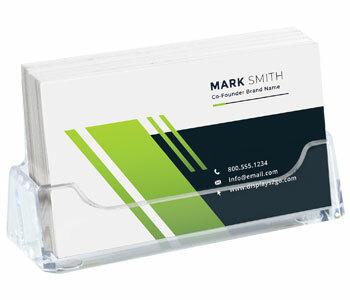 Employees often keep a professional looking holder for their contact info on their desk. 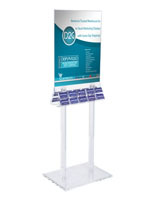 Single pocket business card fixtures are also great for placement outside office doors so that visitors can take a calling card. 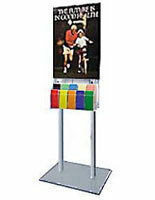 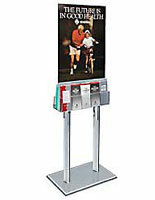 Large corporations often use multi-slot fixtures to easily give away the information for all the agents in the building. 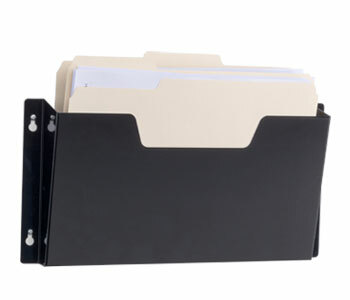 Offices can also make use of our racks for files and folders. 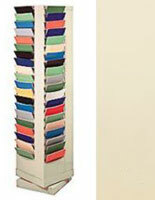 These come in convenient wall mounted and cubicle hanging designs that hold documents wherever they're needed. 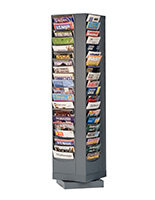 Newspaper stands are often seen in grocery stores and diners. 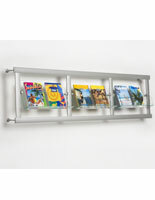 These periodical fixtures can be made of simple metal wire or solid wood and acrylic. 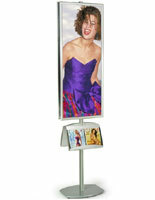 Models with signs can attract extra attention and sell more papers. 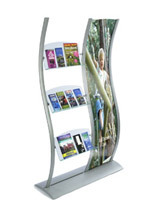 Book displays are made for thicker media and are found in bookstores, libraries, and daycares. 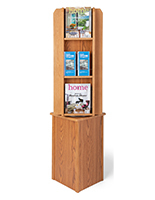 This includes spinners, wheeled shelving units, and wooden furniture with rounded edges for holding children's literature. 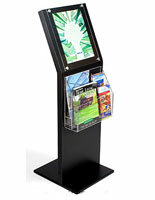 All of these book fixtures feature an open design for fitting the various sizes that paperbacks and hardcovers come in. 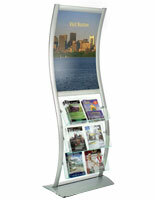 Many of our fixtures are not made for holding just brochures or magazines, but both. 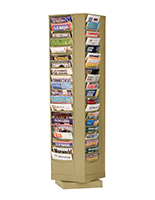 Shelving units with adjustable pockets can feature two 4" x 9" pamphlets in one slot or a single 8.5" x 11" catalog when the divider is removed. 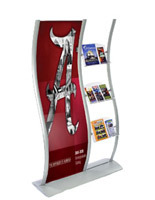 This literature furniture is excellent for companies with different styles of promotional material that need to customize their display. 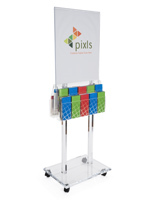 Our selection and practices is made to help any business grow and thrive. 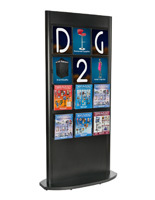 Order on Displays2go.com for fast shipping and wholesale pricing.